Our technicians are experienced in all types of roofing. We work on everything from steel, T.P.O., built-up, rubber P.V.C. and modified roofing. We're upfront about our roofing repairs, so you never have a surprise on the bill. We have the capability to locate and fix the problem. Our technicians are normally able to accomplish this on our first visit. Due to the scope of work that is mandated by some projects and, to ensure our expectations of quality are meet projects may require more time to complete then others. We will ensure that you are kept up to speed on all work change orders, time tables and all work completed. To ensure we are meeting all your expectations we will be keep in close contact during any all work. We work to keep the same technicians on your building so they become familiar with your facilities and with you, making repairs more efficient by saving time and money. Our technicians are on site within 48 hours unless there is an emergency which we will then get there on the same day. 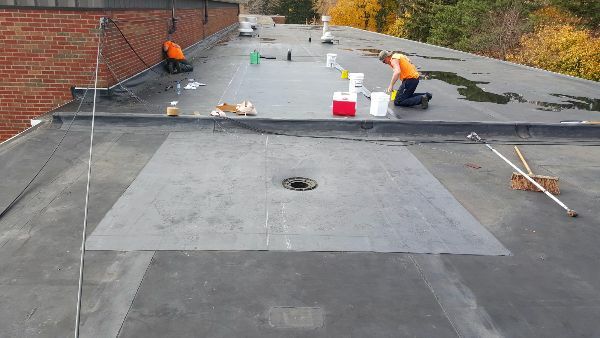 Additionally, we are able to install curbs, vents or most anything you need put through your roof and still keep your products clean and dry.